They were once manual laborers, taxi drivers, fishermen and merchants. 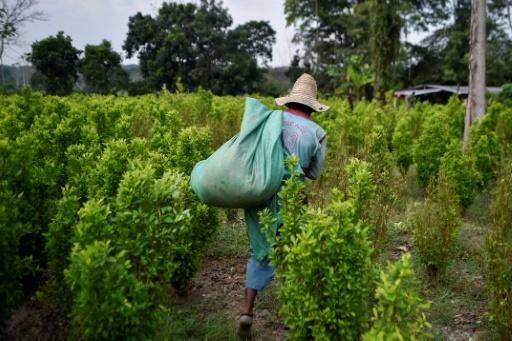 But Venezuelan migrants fleeing poverty and shortages of basic necessities have been forced into new work: picking coca leaves for Colombia's drug traffickers. 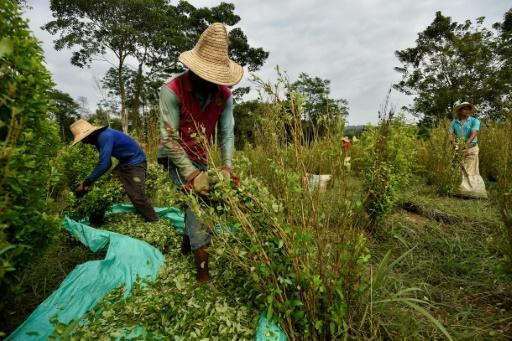 Hundreds of Venezuelans work grueling days on coca leaf plantations, seduced by better pay despite harsh conditions, painful labor -- and uneasiness about contributing to illegal cocaine production. "The problem is the hands," 23-year-old Eduar, who wanted to hide his true identity for fear of repercussions back home, told AFP. "When you grab the bush, they bleed," he said, showing his blistered hands wrapped in cloth for protection. "After this you're afraid and don't want to do it again." Like the other Venezuelans working here, Eduar never imagined he would end up working for the narcos. A father of two young children, he came here two years ago, giving up his job as a motorcycle taxi driver after Venezuela's hyperinflation -- which hit an estimated 1.3 million percent last year -- devoured his savings. Leaving central Venezuela, he arrived in Colombia's Catatumbo border region where initially he worked as a builder. That was less exhausting and painful than the 10-hour days he now spends bent over coca plants, his shirt soaked in sweat and sporting a wide-brimmed hat, come rain or beating sun. He cannot stand the heat on his feet, so he takes off his shoes and rubs his threadbare socks with coca leaves. But nonetheless, as a coca leaf picker he earns $144 a month -- three times more than he did in construction. Like all the Venezuelan migrants, he keeps just enough to live on and sends the rest to his family back home. 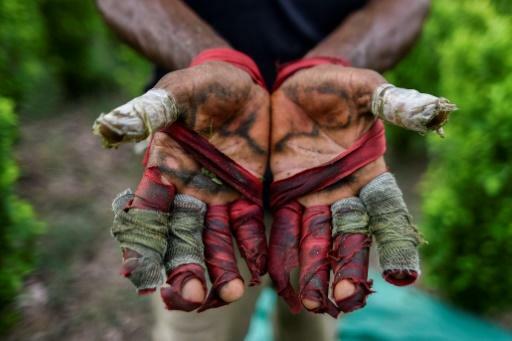 It used to be only Colombians who came to Catatumbo, a region infested with armed groups and home since 2017 to 16.5 percent of the country's illegal coca plantations. Since 2016, they've had to vie for work with Venezuelans. An oil region rich in carbon, it's a dangerous place to work. Rivers of blood have flowed due to the multifaceted armed conflict pitting leftist guerrillas, drug traffickers, paramilitaries and the armed forces against each other. Eduar did not know what he was letting himself in for. Another Venezuelan, Naikelly Delgado, 36, arrived in the small town of Pacelli with her sister in 2016. She used to work in the petrochemical industry and initially found employment as a cook, but ended up in the plantations to earn more money. After her first day of work, she couldn't even wash her clothes. Her hands were "covered with a fungal infection, the skin was discolored," she said, adding that she felt guilty "contributing to evil" and asked God for forgiveness. Endy Fernandez, 36, sold milk products and worked as a builder in Venezuela before taking to the road in 2017, crossing the border and walking 16 hours to reach Pacelli. "I didn't know what the (coca) plant looked like, what color it was or how big it was," he said. He climbed to the top of a mountain where he was given his equipment, a bag to strap to his waist and strips of cloth to protect his hands. Missing their families back home and suffering physically at work, disdain for Venezuela's President Nicolas Maduro is growing among the plantation workers. Although those who shared their experiences said they previously supported Maduro's socialist predecessor Hugo Chavez, they now want Maduro out. "We wouldn't have needed to leave the country, leave behind family, if they hadn't made us broke," said Fernandez. "We're desperate... for something to happen or for there to be a coup d'etat." Pacelli, a small town of just 3,200 inhabitants, has already seen its numbers swelled by 1,000 Venezuelans since 2016. The majority end up working in plantations in place of locals, said community leader Gerson Villamizar. "On the whole, Venezuelans work and send home money," he said. "So the money doesn't circulate (here) and that has a negative impact, especially for shopkeepers." Those who come have to abide by strict rules that ban prostitution, drug consumption or carrying weapons. They also need a letter of recommendation from a Colombian to work, even in the plantations. Around 100 Venezuelans have been expelled for crimes including theft, attempted murder and drug use. Villamizar says that was to "save their lives" otherwise the drug traffickers would have killed them. But despite it all, Fernandez says: "we're happy to have found this." "Otherwise, what would we do?"